My order came in today. Please tell your tailors I said thank for putting extra work for the outfit. I wish I could have done more instead of just saying thank you. The shoes arrived about 2 weeks ago. I'm wearing them now and well pleased due to their good quality. Thant you and your co-workers for everything! I received my first order today... I Love it! I am impressed with the quality and craftsmanship of the Robe! I am also impressed with the speed in which you made it and delivered! I am looking forward to receiving my next order... Thank you for all your kind attention. Thank you for your response. I received the suit for the last order that I placed. I absolutely love it. I am very satisfied with the product and I will be ordering more. I have a question about the maroon satin fabric is it the same color as the picture that I saw the dark gray satin fabric pants. The picture should be in the email chain. It looks like that I am going to try to place an order every two weeks or so until my wardrobe is well stocked. I very much appreciate your great quality of customer service. I thank you once again and plan on doing business again with your company soon in the near future. Hi, my name's Chris Perkins. I just received my order. Everything is great! I received my shoes today. How lucky I am, they fit perfectly. Thank you for your speedy delivery and quality suits! I wanted to inform you that my package finally arrived and I couldn't be more happy! I am very pleased with the quality of the merchandise. I definitely look forward to doing more business with you in the future. Thanks for everything. Hello, I recently purchaced a few items from you guys and i have to say i am very satisfied with them. Here's a picture of the cheongsam I got from you. Feel free to add it in the testimonials section: again thanks for the fine service you provided. Looking forward the next purchase. Disregard my previous message: pants were just accurately folded inside the cheongsam! With that our transaction is complete and i am 100% satisfied! Looking forward buying from you soon again! I'm very happy with it, thanks. I have recommended Willy to buy one soon. I would also like to say I have ordered from you before any have been very pleased with the quality. Thank you very much for your good products and help. Thanks so much, the uniform arrived yesterday, picked it up today and am very impressed with the quality craftsmanship. I am looking forward to wearing it during my tai chi training. The cotton linen cloth feels really nice and cool to the skin, I am very pleased. Thank you Eric. Your company is very good. Thank you again Eric. I just wanted to say that I received my order yesterday on October 26. The pants, socks and shoes fits perfectly. It took a while for me to receive my order, but it was definitely worth the wait. In the future I will order from your company again. Thank you very much Chinesekungfuhustle! Thank you very much Eric for getting this promptly shipped! Thanks, jacket came just as what I wanted. Very happy with the shirt. It will look great when we have group photos in the Tai Chi class. I received the sash and over sleeves today, thank you very much. and thank you for the quick delivery. I will be ordering again very soon. I just wanted to let you know I've received the order today and I am very happy with the fit and light weight material. I am very impressed in your communication with me on my order status and in explaining the shipping process. Looking forward to receiving my shirt. Good luck on your business endeavors. I want to thank you all. The items I ordered fit just fine, and I am very satisfied with the quality of the work. Once I received word the order was being shipped, I can't believe how fast it arrived. I've been impressed with everything. Even when I had questions, there was someone there to answer them honestly, and not tell me a lie. Thank you, I will highly recommend your business with my friends, and to anyone who asks about it. I will be back soon to order more products in the near future. Thank you. I'm excited to do business with you. I just received my Daofu socks, and MAN..! they're like a piece of heaven on my legs! They're SSSOOOO extremely comfortable! And, I can't forget to mention how stylish they look when I do my snapping side kicks! Definite future transactions! Dear Eric, the goods are just arrived this morning. All right! Thank you. You are a very helpful person. I just received my Cheongsam, and it fits perfectly, thank you very much, I love it! Today I received my black Haiqing, and I just want to thank you for the prompt shipping and great quality. This is exactly like my old Haiqing (which was stolen... it's a long story). I am surprised at how quickly it came. Just to say thank you for my excellent sneakers which arrived promptly today. A great service from you. With my thanks and kind regards. My new southern style suit arrived yesterday, and I am very pleased to say, that you have done a great job, the quality is excellent and everything I expected. I'll be very happy to wear it this evening to my Taiji class. Many thanks, I look forward to my next purchase. Eric, you guys at www.ChineseKungFuHustle.com are great! Many thanks for respecting the deadline of my order KF3245. The Tai Chi suit arrived today, and I am very happy as I received exactly what I was looking for, superb quality. You needed much less time to prepare the customer made suit than the shipment to home address. I just received my Tai Chi suit, and it is nothing less than PERFECT. Thank you very much! I will recommend your service to anyone at anytime. The duangua arrived today and it looks great! We received ordered Mandarin Pants. Thank you very much! It is very comfortable and cute! Thanks for the prompt reply and service, Eric, very much appreciated!! I finally made place my order with discount. Thank you so much for your prompt response and help. I'm very comfortable to deal with you. Also, I'm satisfied with my previous order. I will buy again some other time. Thank you so much. I appreciate everything you have done for me. We have revived the products already. Thank you for your service. Thank you! This is very nice service and I really appreciate it. The monk who recently purchased a pair of the Wudang Cloth Boots w/ Cloud Hook Welts like very much. Thank you very much, i have a good reception of my robe . The color is very beautifull . Also, very beautifull stamps from hong Kong. I have to say your products are wonderful and I tell all my friends that admire all the things I've purchased about your amazing website. I have received my order and everything is perfect, thank you very much. I will definitely order from this site again in the future. Thank you! Thank you! Thank you! I received my order today and I'm very happy with how fast it got here and the quality. The goods just arrived. All perfect! The jackets are very beautiful. You are splendid as usual. The right place for the right clothes and the right shoes. I am very impressed and satisfied. My order has been delivered today. It is perfect fit to me, thanks your work. This is Maysin Gappy with the order number KF2658. I just would like to say what a great job everybody did at Chinese Kung Fu Hustle putting together a fantastic uniform for my nephew. He wore it for Halloween and happily showed it off to his classmates. He has an orange belt in Jiu-Jitsu and his new uniform will be presented perfectly at matches. It also not only looked fantastic but it also fits perfectly. Tthank you for the patience for adjusting the measurements. 100% Satisfied. Thank You, CHINESE KUNG FU HUSTLE! Today we received order number KF2692 and we like it very much. Thank you for a good job! My name is Petra Carlsson. I ordered Kung Fu clothes a couple of weeks ago from Kung Fu Hustle. The order number was KF2574. I am very happy with the clothes and the measurements were perfect for me. I have received your parcel today and everything is up to expectations. Thank you so very much. It is a pleasure to make business with you. Hi, Just letting you know how excited I am to know that my order has been accepted. You have such a great range of products, I am sure that you will see many more orders come from me over here in Australia. I have let my friends know about your store so that they too can purchase some of your gears. Thanks again, yours in waiting. Thank you very much, I received my order this morning. The shoes fit perfectly! I will be sure to order from you again. Once again thanks so much. I want to thank you very much. The costumes are here. Thank you very much. Now, I am going to place a new order. I just wanted to thank you for your excellent service and the high quality of your products. Your kung fu pants are really well made, and the colors are beautiful. Also, the Warrior shoes fit me perfectly and are even more comfortable than Feiyues. You should advertise in the U.S. so that more people know about your company, because what you offer is far superior to the other martial arts clothing available here. The shirts and shoes arrived very swiftly and fit perfectly. Thank you for the note concerning my foot size, but I have big feet for my height - the shoes fit just right. The craftsmanship in the shirts is lovely and I am very pleased to discover that they have 7 closures instead of the 5 shown in the product pictures. Your quick communication during the order process was greatly appreciated. I look forward to continued business with you. The suit has been delivered yesterday. I'm very well pleased. The suit looks nice, quality is great, it fits perfectly and the shipping was quick. I have received your shipment in good shape and plus, very fast in delivery. The customized Sun Yatsen Suit and the Mandarin Collar Long-sleeve Underwear agree exactly with my body measurements. The excellent pieces of tailor work and fabric definitely worth the price. The customized design of this website and also the customer service are impressive (the updates of order status and the reply to my inquiry message is really timely). Thanks again for your help! I will come back to shop for other items. I have received your shipment in good shape. Thanks very much for such a great service to handle directly.. I will recommend your firm to my business relations. I would like to thank you for my beautiful silk Kung Fu suit, it fits me just the way that I wanted to, your tailors are the best. Again, I would like to say than you I couldn't be more satisfied as if I was right there and they measured me for the suit, because it fit me perfectly. I ordered a uniform another company online and I wasn't pleased at all I had to send the suit back, but with this suit your company did a great job. Thanks, I won't be sending this one back! Hey Eric, just wanted to let you know I love the Shaolin uniform I ordered form you. It is excellent and just like to promise here I will order from you again. Order arrived today and all I can say, "Outstanding!" The fabric, the fit, the craftsmanship, everything is absolutely wonderful!!! Please let me know if there is ever anything I can do to support you and your wonderful business. You have earned my highest recommendation in every way! I have the order, it is all of great quality, thank you again. As I said we will now exclusively deal with you for our needs. Recently received both my vests and pants I ordered and I must say it is by far the most ELITE and Functional dressing I have ever worn. The pants grant my kicks limitless range and reach and offer me the ability to properly perform acrobatics as some of the techniques call for. The vests are also incredible! Fits very perfectly and graceful, the vest is superior to any I have worn before not just based on its outstanding looks but its overall functionality, performing in monkey style while in its frolics tore up all previous uniforms after a single use of the style, the vest beats them because I don't limit my movement as well as retaining superior style and looks after i rigorously train it!!! I can PROUDLY and GLEEFULLY say that I'm going to be ordering more customs from you guys very soon! Thank you very much for providing all beyond my necessity in my training. The robe arrived today, Wednesday. Quality is very impressive and fit is perfect! Color is just right. Thank you for your extra considerations and help. This message is just to let you know that I received my order last Saturday and I'm very pleased with it, I liked each of the products I bought. Also I really appreciate the way you treated me the whole time and you can consider me a satisfied customer. I also have recommended the store to my other fellows in our kung fu school. Thanks for everything and I'm looking forward to buy some more products from your page. WOW!! Ni Hao.....Hi Eddie, many thanks for the DVD it is brilliant the subtitles are great and picture quality is very good indeed A lot of effort has gone into this DVD it is very much appreciated.... Just to say you have a great website and good luck with it. Just a word of thanks for all the help with my orders, apart from one little glitch, promptly resolved... they are all perfect, sizes as requested, delivery prompt, customer service as it should be... I have recommended you guys to some of my brothers and they have also received excellent services. Keep up the grand work( this I think is the standard) and I look forward to continued business with you guys. Thanks again. Thank you so much for your speedy emails and delivery of the outfits. This is a huge relief for me and I am very happy with those outfits. Just writing to let you know that I have received the package. Thank you for all of your help and I have another important function in September so I am wanting another outfit, this time I will give you a lot more notice. Thanks once again for making our wedding day very special. I just received the Shaolin Wuseng Single Arm Robe. It is great! Fits well and is very well made. Just received the order and I am very pleased indeed. Delivery time was very good and the jacket and trousers are excellent. I look forward to another order. I wanted to take a moment to express my sincere appreciation and thanks for your help with regard to my order. I finally received the package 8 days after you sent it.... I am very pleased with both products. The quality of your products are very good and the service you have provided has been most helpful - including giving prompt responses to my e-mails. Thank you. 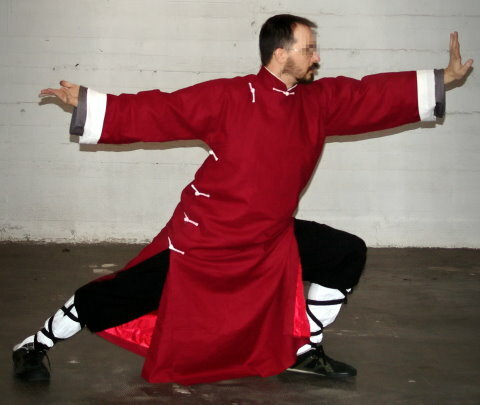 I have recieved the Tai Chi suit and love it very much! Great news, the parcel has arrvied...I am happy to say the products look and feel great, and good fitting as well. The t-shirts are here, I am very satisfied with them. Parcels received today. Thanks for prompt delivery I am well pleased with merchandise. Hello - The suit arrived and it's fantastic. Thanks to Eric and Lily for the updates. Brilliant job, thanks again. Thank you, Chinese Kung Fu Hustle. I just picked up my order and I'm very satisfied. It fits me perfectly. At first, I was a little worried because of sizes since I'm tall, but it is perfect fit. Again, thank you for all your helps and your team for keeping me updated on my package. I'm definitely placing more orders. Just to inform you! I am an older gentleman who has been practising Tai Chi Chuan during several years - together with some very good friends! Our Chinese Master is: Tung, Kay-Ying well known / and with Academy in USA. In that connection, have been placed one order before and I will properly return again, some time - because of your ability to deliver high quality products with best services to my outmost satisfaction. I thank you ones again! Thanks, I have received the items and again they fit perfectly and the material quality is very comfortable. I am gratefully for all the efforts and I will be back again very soon. Just wanted to say thank you for your prompt service. Everything is great. I will be ordering more soon. I have received the item.. thanks a lot. I am very happy with it. Please keep my sizes list because I will be back to get more robes. Once again, much appreciated for the perfect fit. Take care, will be in contact soon. I received your message and thank you for all of your efforts which is greatly appreciated! The outfit looks great!!! I will have a photo taken of me in it and will send you a copy of it soon!! Thank you for the Birthday Gift!!!!! I am truly honored that you thought of me in such an admonished way!! I look forward to our continuing business relationship!!! Once again, Thank You very much!!! Don't forget to take a moment of silence during the day to reflect on the spirit of Master BRUCE LEE!!! I received my package on Friday. Thank you very much. I am very happy with my order and I appreciate the time spent customizing my robe. thank you. Just wanted to thank you for the swift and accurate order I received back in May of my Shaolin robes. I have been looking for authentic Shaolin wear for quite some time and have run across very little. Your company changed that! This was also (believe it or not) my first international order and I wondered how it would go. All was perfect! Thanks again. You have earned a repeat customer! Hi, just want you to know that I received the pants which fitted perfectly. Great service, and will definitely buy new things again and recommend it to my friends. I've been searching for quality Chinese clothing for years. I've been in New York City China Town and searched web site for China Town located in California. When ordered they're clothing and compared with the Chinese ethnic clothing that I've brought from you it's like some offering me a dinner with a plain can of Potted Meat or Top Prime Rib. Please believe me there is absolutely no comparison what so ever. "Chinese Kung Fu Hustle" is the supreme when comes to top notch in CHINESE CLOTHING. So, I highly recommend any and everyone to do their shopping at Chinese Kung Fu Hustle. The staffs are most kind in pleasing their customers and far beyond to make we are very much satisfied and their attention to detail is a 10 on a scale from 1 to 10, and that's fantastic. Thank you so very much Eric for Excellent Service and that will make me a customer in the years to come. I received my suit today in good order. It fits perfectly. Thank you again for your excellent service absolutely fantastic. I am really impressed by the exact timing. In The Netherlands, where I life, it is crap and bad compared to what you do. Thank you again and when I need something I will know where to go to. Hey, I got the vest today in the mail and just want to say thanks! It turns out better than what I expected, and it is definitely worth 50 bucks. Thanks again! I want to thank you for arranging the prompt delivery of my order, which arrived today. I am very pleased with everything. I received my order KF1205 yesterday in good order. Thank you again for your outstanding work and planning. This is absolutely increditable fantastic. If I need some Chinese suits, I know where to go to. It is an amazing experience to order the goods and see them coming all the way from Hong Kong so quickly. Thanks again for everything. I received everything in a timely manner and the packaging was very good. Everything arrived in great condition. Thank you for getting these items to me so quickly. I greatly appreciate it. Thank you, I received my order today (nr. KF1180). I am very pleased with the quality. Thank you for your absolute great outstanding services, all the way from Hong Kong to my place Eindhoven in the Netherlands. It was like clockwork, great great services. One of the best services I ever experienced. In a couple of minutes, I will order an another suit. Great quality and great price. Best regards, and you will see me more. Thank you very much for my order - safely received and a great success. I will be dressed perfectly for Chinese New Year celebrations tonight! I received my 4 suits and they are fine. I just received my package and my robe is very beautiful. Thank you so much. I am studying to be a Buddhist Monk and I am looking forward to my meditation today in my new clothes. Thank you again and I will contact you in the future for new robes. I'm very pleased with the high quality of fabric and detailing of your tailored garments right down to the hand stitching of pant leg cuffs. The beautiflly crafted and the fully lined jacket is very impressive. I will be ordering more from CKFH now that I'm assured of a perfect fit and excellence. It was my good fortune that directed me to your web site. I have just received my order, the quality of the material is excellent!!!! It is perfect fit and very good service, would definitely recommend your website. Thanks from 100% satisfied customer. I am EXTREMELY happy! The items are of better quality materials and workmanship than I have anticipated. The shoes and socks are THE most comfortable I have ever worn!!! Worth for every penny spent! I am a customer for life! I received my order today and couldn't be happier! The products are of fine quality and they were made to accommodate special requests. I whole heartedly recommend this site to people looking for Chinese garb. Goods has been delivered by DHL today. Heartfelt thank you to everyone. Recieved my order. I am very happy with the products. Much Blessing! A happy customer! Order received in time for my kung fu performance! They're great, thank you for the fast turnaround. Please let me express my respect for your company - your company is the first I have ever dealt with that has taken the time and the trouble to sort out specific details. Title: A company with respect for it's customers. I have dealt with Chinesekungfuhustle.com a few times now and I am an exceedingly happy customer. The products offered are of the highest quality you can find anywhere and completely authentic. The customer service is also impecable. When I need to contact customer service about an order, the response is swift and polite. I have been looking for monk's shoes for 20 years. I grew up in Hong Kong and the pair I left with lasted me many years, but really had seen better days. I couldn't throw them away. These shoes are undoubtedly the most comfortable, elegant, strong, lightweight ,well-made shoes in the world. Thank you so much for supplying them. I'm sure you will get more orders from this little corner of the UK now. My order has arrived. They are beautiful stuffs. Thank you for everything. I just recieved my Zhongshan today in the mail, and I love it! I am planning to purchase again later on in the future. Thank you very much. Our tai chi workshops and seminars convention welcomes you! If you are ever selling in America on the east coast, it would be fun to have you as a vendor at our event. You have such interesting stuff. We host America's tai chi convention, known as the Zhang San Feng Festival. It's great to see all the nice things you have! (Someone gave me a gift from your company - that's how I heard about you.) Keep up the good work!!! 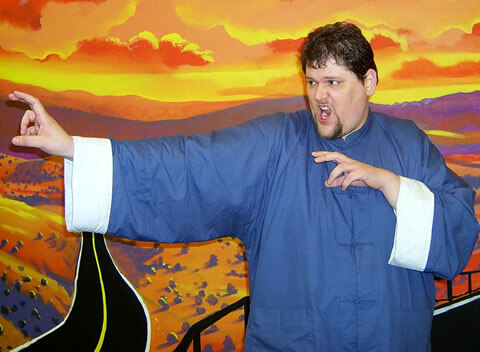 I finally got some digital pictures in my kung fu jackets. Thank you so much for making such wonderful clothes. I've received my Hanfu robe and am very satisfied. In future, I will make several more orders. 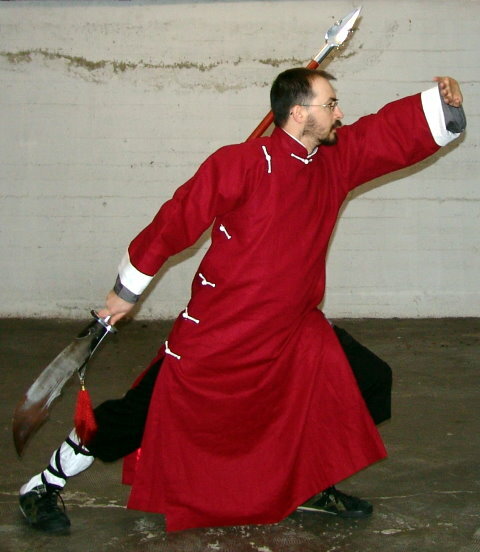 I am interested to order some garments (Wudang shirt and/or robe) ... Thank you for your attention to this and your good products!!! Many thanks for your goods, for your quick work and for the good services. I am happy and my daughter too. I thank you for tracking the items for me. Yes, I did receive them on Monday at noon. I am pleased and very grateful that you took the time and went out of your way to do so. You are truely a great person. The shoes quality as well as the pants and that my friend you can tell as to approx to the ones that are sold here in the USA. Well my friend, I thank you again. Pray for the best for you and your family. The creator of all be with you all! Thank you so much for the shoes, I was worried about they wouldn't fit, but they fit so perfectly and are so comfortable. I have already ordered another pair. Thank you very much for such a wonderful product. These socks are very comfortable, and allow for easy, quick movement. I would recommend them to any of my kung-fu brothers. Thanks once again. I am writing this message just want to thank you and your staffs for your efficiency and sending me the right pairs of shoes. They are excellent and fit perfectly. Well done! Please keep on the good work. The shoes are fantastic. They came in just a few days after you shipped them and they are "the real thing". Excellently made from top quality material. My order KF0250 arrived today. Very nice pants and fast delivery, thank you. Hello - I just received my order and it is exactly what I wanted. Thank you very much for everything. I am very happy with the items I ordered from you last month. I love the cheongsam and would like to order another just like it, except I wonder if it could be made 8" shorter. Could you let me know if this is possible? This store is absolutely spectacular. 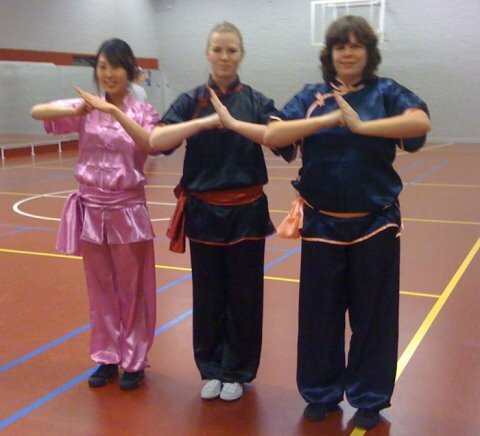 I've done shaolin gung fu and jinenkan ninjitsu for years, and it is so hard to find the clothing, whether it be for training or leisure that isn't cheap or look nothing like the real thing. I don't know what I would do without you guys, and it so hard to not order everything in the store multiple times, lol. Keep up the excellent work, and know you have a life long client over here!!!! I have received the order today, I am satisfied with the exchange. The shoes fit well, the socks are a perfect fit and the robe is much better this way. I have just worn the outfit to practice my tai chi this afternoon and it's very comfortable, feels nice and looks great. The sole of the shoes are perfect for tai chi, smooth enough to slide but enough grip to plant the feet and push off the heels, best i've tried so far. Once again I appreciate all your care, attention and understanding in dealing with the problems we've had on this order. I will be back to order other items in the future. Just thought I'd send a short note to let you know that my order arrived safely on Tuesday, and that I'm very happy with what I received. I hope to continue doing business with your company in the future. Thank-you very much. Thank you very much and I am very happy with my first order! I'm an actor, writer and amature film director. I love these outfits. They are confortable and stylish. I have worn them to formal occastions such as film openings. I wore this red silk kung fu outfit as my vampire character in the current film I'm making Vampire Expose'. With me is American actress Moriah Moreno who also appears in the film. 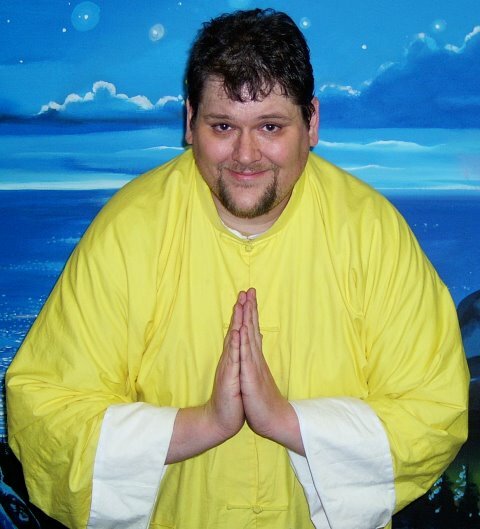 I have also sent an e-mail to a friend asking him if he has any digital images of me in my yellow kung fu outfit which I wore to a Premier moving amongst a crowd. Thank you so much for the clothes and shoes. I appreciate your time you put into making these items. They are very beautiful and I will order from you again in the future. Thank you very much for adding new products to the men's plus size category. I loved the first kung fu jacket I ordered from you. I will be interested in a Mao suit when they become available.